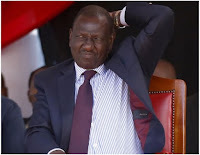 Home / Editor's Choice, Entertainment News, Featured Articles, Gossip and Drama, Videos / WILLIAM RUTO ni mwizi na dictator, he is worse than IDI AMIN - KISII guy rants (VIDEO). WILLIAM RUTO ni mwizi na dictator, he is worse than IDI AMIN - KISII guy rants (VIDEO). Wednesday, August 22, 2018 - A famous social media commentator from the Kisii community has attacked Deputy President William Ruto calling him a thief and a dictator who is worse than the late Ugandan President Idi Amin. According to this guy, Kenyans will regret if they elect Ruto as the President in 2022. He dared the Deputy President to take him to court for calling him a thief and bragged that if he takes legal action, he will defeat him because he cannot account for his massive wealth. Listen to this Kisii guy attack the Deputy President.